Unlike international relations, international law has a long-standing tradition of teaching and research that connects history and theory. While international relations scholars are not especially trained to think contextually, since international relations theory tends to be taught and assimilated detached from historical concerns and it is very hard to find courses on the history and theory of international relations, international law scholars have forged at least a tradition in the curricula of teaching the history and theory of international law and conceiving of these two dimensions, if not as mutually inter-linked, at least as related to one another. In recent years, a new wave of innovative scholarship, exploring the historical trajectory of international law and its complicity with colonial and imperial endeavors, has emerged. In fact, this transformation has been often regarded as a “historical turn” and even “imperial turn.” Yet most of these pioneering contributions were written by scholars strongly attached also to the field of the theory of international law, such as Martti Koskenniemi, Antony Anghie and Anne Orford, among others. Therefore, it is timely and worth assessing the implications of such transformation for theoretical innovation in legal theory and interdisciplinary research in order to create new grounds for a comparative and fruitful dialogue between history and theory. One way of assimilating the contributions of this new body of scholarship is to conceive it as a broader shift in focus in international law and international legal and political theory from normative theories of global justice to empirical studies about the legitimization of historical situations of global injustice. More specifically, thanks to these recent studies exploring the colonial origins of international law, the complicity of certain liberal internationalist legal ideologies with imperialism and the civilizing mission of international law, among other themes, scholars in the field have begun to learn new lessons that demand new frameworks and new ways to come to terms with global justice through a much greater awareness of historical situations of global injustice. Learning these lessons might be disappointing and could lead to loose faith in the potentialities of international law to produce global justice, generating profound skepticism. Nevertheless, it contributes to unveiling the strong limits of international law for transforming situations of global injustice, as well as the concrete and rigid structures of the international legal order. These studies have generated a new skeptical legal and political sensibility that is historically more aware of global injustices. Therefore, concrete global injustices, rather than the production of normative frameworks for theories of global justice, seems to be the new point of departure for formulating new international legal theory today. These studies have generated a new skeptical legal and political sensibility that is historically more aware of global injustices. Another final lesson with theoretical implications that stems from this so-called historical turn is that international law is a very flexible and elastic language and therefore comparative and interdisciplinary research that touches on the connections between history and theory and examines openly international law as a flexible and complex language, deeply embedded of political concerns and anxieties, are essential. For the historical turn has also shown that international law has been highly politicized, despite the fact that many international lawyers tend detach international law from power politics. Although such studies have shown that international law has been generally deployed for legitimizing imperial and hegemonic projects, it has also been and continues to be deployed as a legal tool to limit, resist and confront with imperial policies. Indeed, it is necessary to enhance our understanding of the histories and theories related to the deployment of international law for anti-imperialist purposes. Finally, these two dimensions, imperialism and anti-imperialism, should be explored comparatively as interconnected in order to assess historically and conceptually the potentialities and limits of international law for dismantling situations of global injustice and generating mechanisms for power balancing. For instance, international law has been especially flexible in the Americas, since it was invoked in complicity with imperial projects and at the same time with the aim of putting forward anti-imperialist and anti-interventionist legal aspirations, especially regarding US military and unilateral interventions in Latin America in the early twentieth century. In order to take these comparative lessons seriously for the making of legal theory, it is also worth forging a much more consistent dialogue between history and theory. Featured image credit: “Administration” by Pexels. CC0 Public Domain via Pixabay. Juan Pablo Scarfi is a Research Associate at the Argentine National Scientific and Technical Research Council (CONICET) and an Assistant Professor in International Law and International Relations at the School of Politics and Government at the National University of San Martin, Argentina. 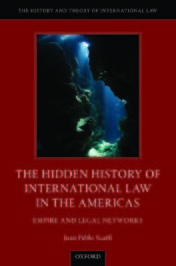 He is the author of The Hidden History of International Law in the Americas: Empire and Legal Networks.